May requests "a nice cup of Milo" which is presumably something like Ovaltine? The officer in duty in reception is uncredited despite responding to Ann's "Good morning, Margaret" when she arrives at work. Meg tries to calm an agitated Jenny by pointing out that since there was a hung jury, some of them must have thought she was not guilty, but Jenny says she can't face a retrial. May clouts Nikki after she flicks some fag ash on a pile of sheets that have just been washed, and for the first time Nikki seems outfaced and runs out of the laundry. She bumps into Julie who notices she is crying. Joan refuses to open a security gate to let her through and walks away smirking. Ann calls Adrian Bullock to her office to confront him with the invoices and tell him to call off the heavy tactics: he repeats his threat against Pippa but she says she will mail the invoices back to Chaucer. Cindy and Nikki are forced to sit down in the rec room and listen to such terrible threats as that they will never get a man if they have a criminal record. Joyce is relieved to hear from Ann that the blockade is over, as it means she and Mervin can talk to each other again, but Mervin isn't so sure. Nikki offers to sell Lexie cigarettes and pills. Lou trips Nikki up in the dinner queue but Nikki is wise enough not to lag on her. Jenny wrecks the piano in a fit of pique (apparently with her bare hands) and is forbidden by Ann to play it for four weeks. 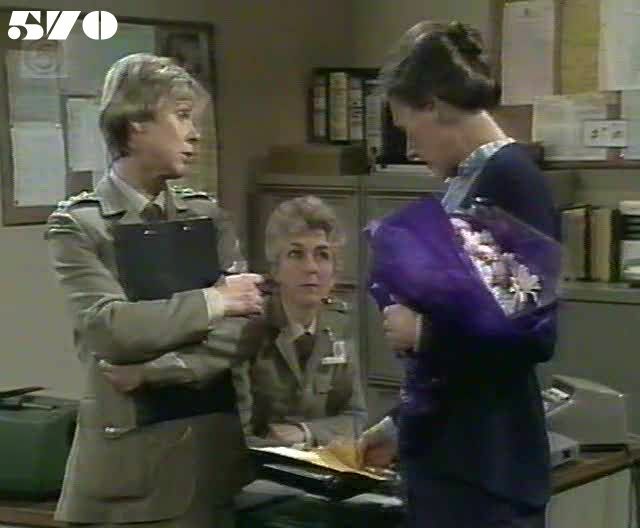 Terri sails into the house and (ignoring Joan's complaints about the state it was left in) tells Joan she has found a job with a security firm. Joyce and Mervin try to make it up, but end up squabbling. Julie notices Lexie is a bit jumpy and works out she's been taking something. May proposes contacting Queenie Marshall to frighten Nikki on the outside as well. Ann tells Pippa that Ben has decided not to drop Daphne's case after all. Nora notices Lexie acting strangely (acting drunk, in fact). Julie tells Nora that it's Nikki who is dealing drugs. Ann gets a bunch of flowers as a thank you from the leader of the blockade for the settlement they have been offered by Adrian Bullock. Willie pretends to be interested in buying a Valium and when Nikki gets it out from her pocket, the other women jump her, collect her pills and put them in the washer. Nicki shows them her knife and warns them all not to try to take it off her. Lou proofreads an advert typeset by Lexie and says it has to be done again because "Wiener" is spelt with a V. Queenie visits May and hears the proposal to fix Nikki on the outside. Pippa invites Ben for lunch at Ann's house - a Japanese meal to the accompaniment of koto music on the stereo. Lexie and Nikki fight when Lexie catches Nikki cheating at cards. Terri brings her boss home while Joan is out and glosses over the true nature of their relationship, describing her as her landlady. The fight in the rec room has to be suspended when Joan passes by on a routine patrol. Nora hands Nikki's knife over to Ann, and persuades her not to hold an immediate cell search. Willie, May and Nora pretend that Nikki has passed some "test" and she is the perfect one to help with an escape. Ben tells Ann that he intends to get Pippa to agree to marry him.